The British High Commission in Nairobi, Kenya, are informed that Tessa Quayle, the beautiful wife of Commission diplomat Justin Quayle, was found murdered. Tessa was a human-rights activist, and her good friend, the African Dr. Arnold Bluhm, which was an aid worker and was with her at the time, is missing. This could have been a simple 'Who killed Tessa' mystery novel, but it isn't. The reader gets a fairly good idea about who’s behind it from a rather early stage, and while one can't be perfectly certain about it, it makes the book less of a murder mystery, and more of a thriller: will her husband, Justin Quayle, be able to uncover the truth, and prove what we all suspect? Justin, a skilled gardener who took little interest in his wife’s human-rights activities before her death, is now on a quest to find the killers. But it seems that everybody else is trying to stop him, including the British Intelligence, the Foreign Service, the Scotland Yard, the Kenyan Police, and of course the real suspects: an international pharmaceutical company called “KVH”, and a company called Three Bees, KVH’s representatives in Africa. For KVH, Tessa was a real pain. She was trying to prove that they were using African patients as guinea pigs for their new wonder-drug Dypraxa, supposedly a cure for tuberculosis. She kept sending letters to Three Bees, asking for answers; she was documenting their experiments in Africa; and she had provided people in the British High Commission with a very detailed report that somehow, after had death, disappeared. The book tracks Justin’s actions as he tries to track Tessa’s activities after her murder. The book also includes several minor sub-plots, but most of them seem to be leading nowhere; it would have been a better book without some of these parts. 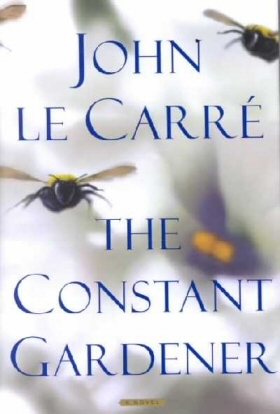 But what makes it a highly enjoyable read is Le Carre’s writing style, his mastery of understatement, and of course the adventure’s conclusion, which would hardly surprise anyone who read some of Le Carre’s other works. Perhaps the scariest part of the book is the Author’s Note, at the end -- the part that explains that “in these dogs days when lawyers rule the universe,” he has to include disclaimers, stating that (almost) none of the characters (and their actions) is based on real life. But then he also adds that during his research for this book, he “came to realize that, by comparison with the reality, my story was as tame as a holiday postcard”. I believe the penultimate paragraph answers some of your questions (and it also states that I agree, the book would have benefited from being somewhat shorter).